The region’s logistics industry – Lehigh Valley warehousing in particular – is continuing to grow at a rapid pace, with more and more large companies setting up shop and acquiring space. In this post, we’ll look at the statistics related to that growth, and learn why, according to CBRE, Lehigh Valley is the second-fastest growing market in the world in terms of logistics real estate. Also known as the “PA I-78/81 Corridor” or simply “The Valley,” the Lehigh Valley is made up of the eastern Pennsylvania counties of Carbon, Lehigh and Northampton along with the western New Jersey county of Warren. 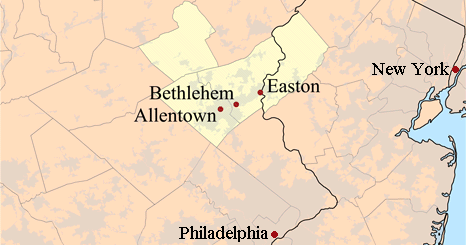 It is the 64th most populated metro area in the U.S., and Allentown is its largest city. Most importantly for our purposes, the Valley is located alongside interstates 78 and 81, and is just 60-80 miles from the Port of New York/New Jersey and 60 miles from the Port of Philadelphia. As space is becoming increasingly scarce right next to the major Ports, many companies are looking inland for operational space. According to a recent JOC article, there is currently 115 million square feet of industrial space in Lehigh Valley, with 5 million more in development and an additional 10 million square feet proposed. There are many reasons why companies big and small are looking inland to the Valley for their supply chain operations. Among these reasons are location, cost, and space. Location. As mentioned above, the Lehigh Valley has access to two major interstates, and is relatively close to the Ports of New York/New Jersey and Philadelphia – along with those major metropolitan markets. The location factor, however, could become even more pronounced as there is talk of a rail link to the Port of NY/NJ – possibly linking the Port to an intermodal terminal in the Valley at the former Bethlehem Steel site, which is already served by a Norfolk Southern rail line. Cost. According to the JOC, “Prime logistics space in Lehigh Valley, rents for about $5.50 to $5.75 a square foot. That’s less than the $7.55 per average square foot rates in Central Jersey, which is about 35 miles from the port and 45 miles from New York City, CBRE said. Prime space in the Meadowlands, which is about 10 miles from both the port and the city, goes for $8 to $9 per square foot.” So, while a 60+ mile dray may not sound impressive, at first, it suits many companies just fine once they see the cost difference in warehouse space. Modern space. Simply put, the Valley offers more space at a lower cost than is otherwise available closer to the Ports, where space is not only costly, but scarce as well. There is another difference, here, however. A good – and growing – chunk of the Valley’s industrial space is of recent construction and offers the modern amenities (e.g., taller, larger space) that are much harder to come by in those major metro areas. At KANE, we are happy to see that the things we love about Lehigh Valley warehousing are being discovered by more and more companies. For importers, our 3PL warehouse operations in Allentown are ideally situated to economically reach Northeast and Mid-Atlantic markets, justifying the dray inland. If you’d like to learn more about the many competitive advantages your company can enjoy by operating here in the Valley, contact KANE today.